heater is 6.3V and 0.9A needed and same as Pen45 , many person said this is family of Ameican 6V6. but these europian pentodo's cathode is very fat than 6V6 family. many DIYer said same family of 6V6 and EL84 of only chatactor. 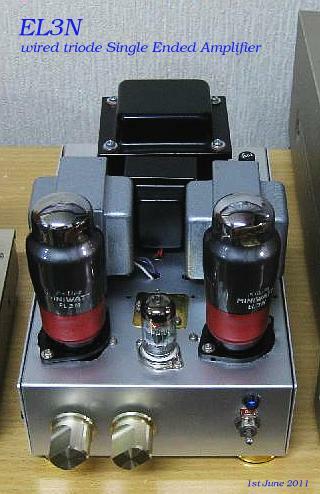 very similar of direct heating triode. are just similar of each other.many person said PX25 is not triodo.is tetrodo. dissipation of 9W. old small europian pentodo are very good. so will be get good sounding depend on what kind of audio transformaer using. 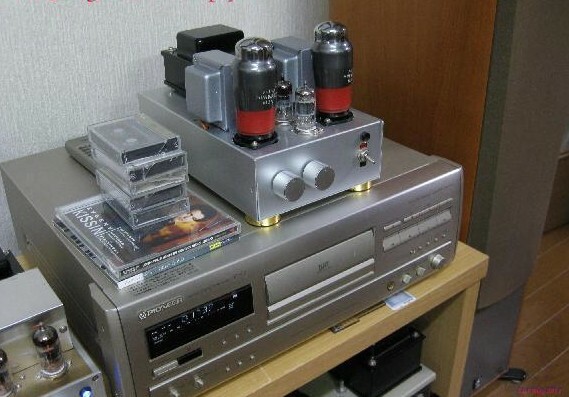 This time using Audio Transformer from Noguchi Transformer Kiwame PMF-7WS. 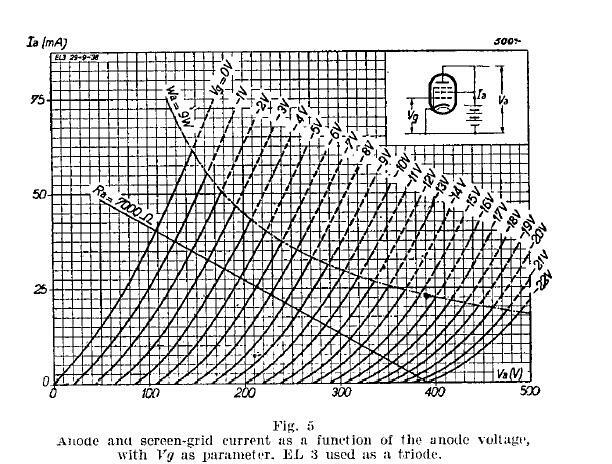 and primary impedance is 7K ohms. probably to get sound next weekend. so Spec of Philips said Triode connection will be get around 1.1 W rms. if do you have over 91dB/m/w efficiency speaker enough to use at home. years ago. Mr's name is Don Francisco Mella in Chile. As you knowEuropian old power valuves makes Classic sound good. and American old power tubes made sound for Jazz good. this word knows evrybody(audiophiles). E88CC and if would like to lesten Jazz Music please use 6N1P is good. 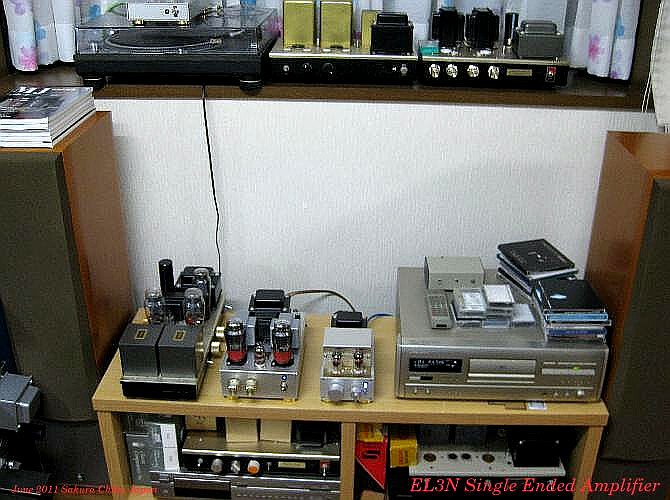 this time using small 7K ohm Audio Transformer so does not get all of charactor of EL3N. if good big transformer like Hashimoto Transformer will be best for getting good bass. 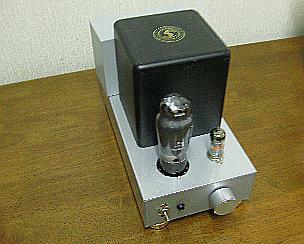 Sound is very nice,Just like charactor is very similar of E406 Triode single ended amplifier. similar.sound is good for both Jazz(6N1P) and classic(E88CC) when using each driver. If would like to build up : Coupling capacitor is use Black Cat. Black cat capacitor is very clear from low frequency to high range.Mfg is Cornell Dubilier USA. coupling capacitor.very expensive.but very good one for Audiophiles. getting distortion signal within a half cycle of full wave. so what need to do ? I have to make distortion at half cycle of full wave. this case is , 47K ohm of 6N1P made up distortion signal of a half cycle of sound. 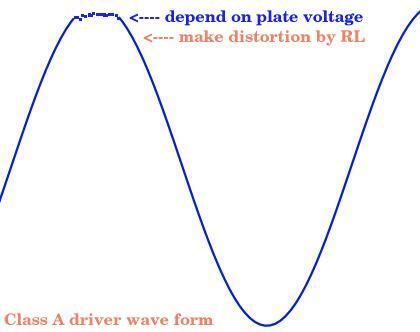 depend on what kind of driver using,different place of componets make half cycle of full wave. 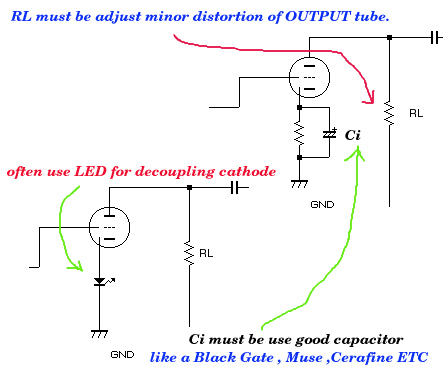 can make distortion signal by cathode resistance of downer amplifier of srpp. driver tubes.for ex europian power pentode and some of American tubes like 6V6,6F6 etc. watch distortion meter then adjuste RL value. we call it's "HIZUMI NO UCHIKESHI" 歪みの打ち消し,and "Distortion cancellation"in english. 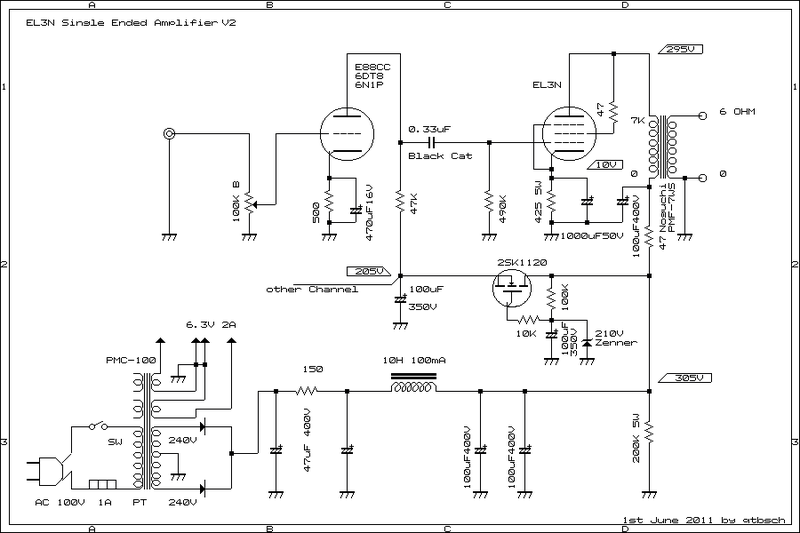 circuit is very simple so can be use any power tubes driver. 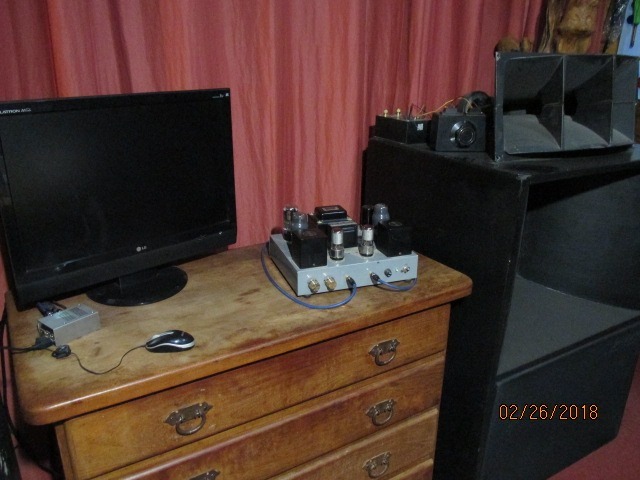 this EN3N is, made on 1940 by philips.but getting very modern sound from my speaker system. this moments.good bass and very clear mid and high frequency ranges. 260 V + B and 39 mA ,cathode resistance is 150 when using penthode modo.load is 3.5 K ohm.many case using 3.5 K ohm. You can feel that it is about 3.5 W sensuously. Please provide an amplifier with low distortion. It does not sound like a vacuum tube made in the 1940s. I'm surprised! 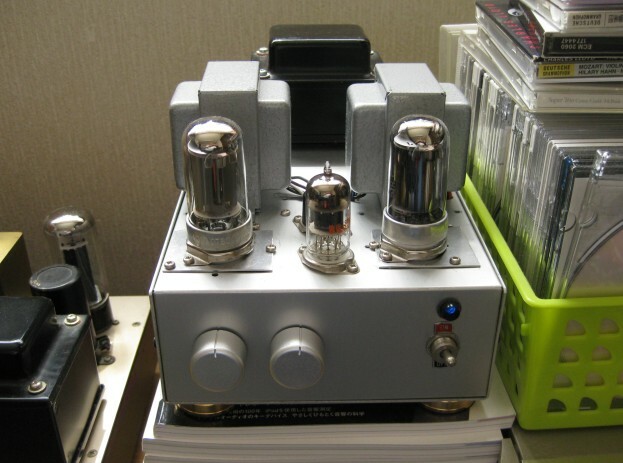 I do not know if the characteristics of this transformer are good or the characteristics of the vacuum tube are good, but I think it will make a very pleasant sound. Even from the viewpoint of the EP-IP characteristics, I think that the linearity is very good and similar to 45. I feel like it. This small transformer inductance is relatively high and gives a very good sound. good separation than before.sound is very clear snd seems look like triode tube. 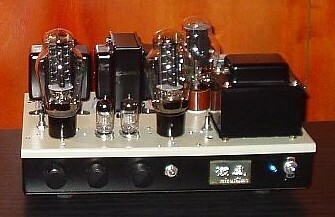 is very modern amplifier sound. 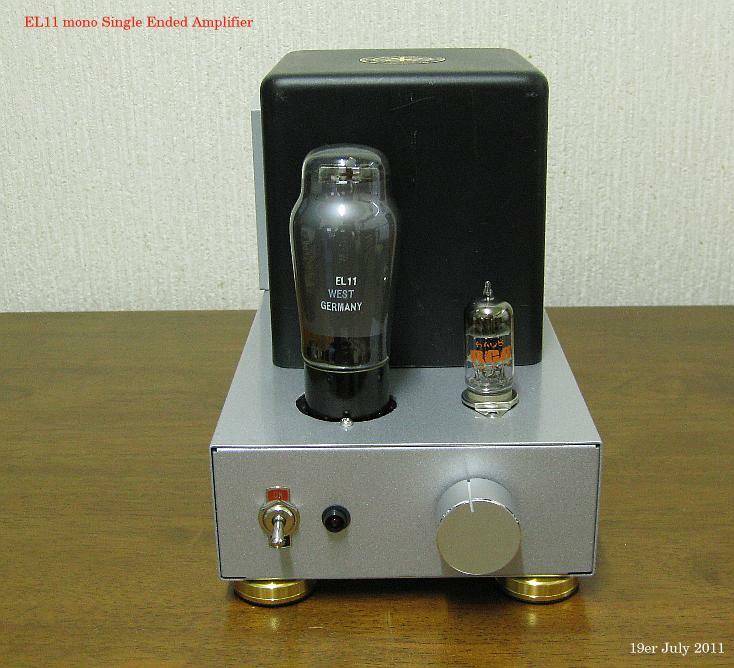 sound very good for Classic and Jazz.EL3N is only 1 W rms under wired triode condition. but sounding is just like sound of triode valve. 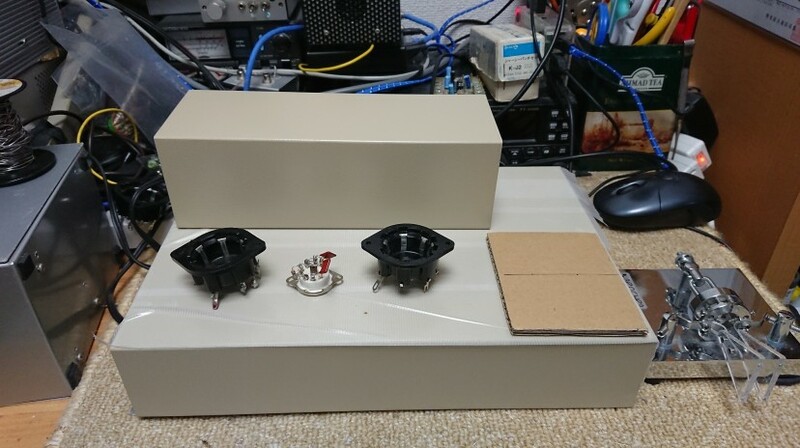 good sound with high impedance inductance.I will go to build up again EL3N Single Ended Amplifier.if I have time.as soon as possible. 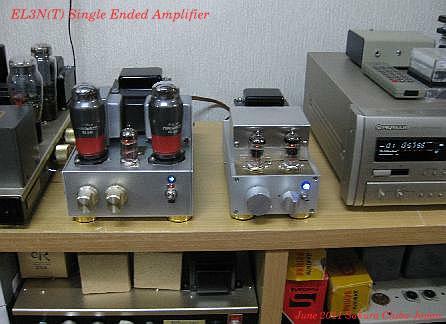 amplifier by high end single ended Tango Transformer as soon as possible.please wait for while. Transformer.primary impedance is 7Kohm, very big single ended amplifier use transformer. very heavy and Max power is 30W.it's will be get around 1.1W rms wired triode connection. 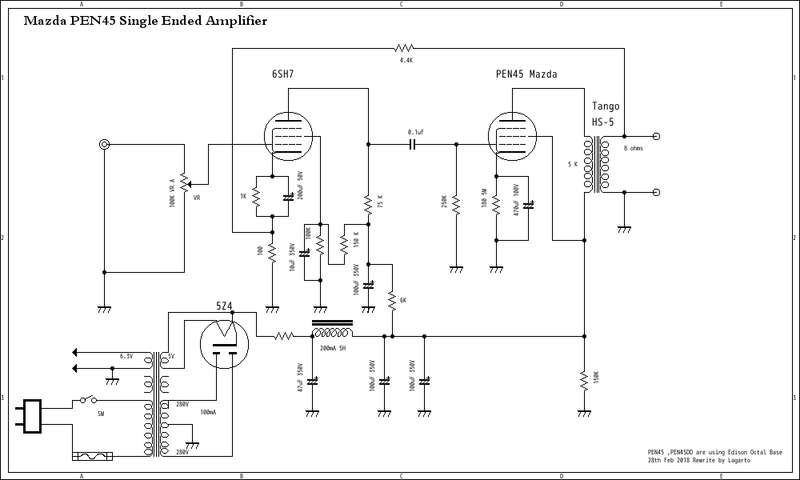 circuit is same as EL3N Single Ended Amplifier. If would like to buy Kiwame ,can get from Acoustic Dimension and please see next link. can buy in your country. 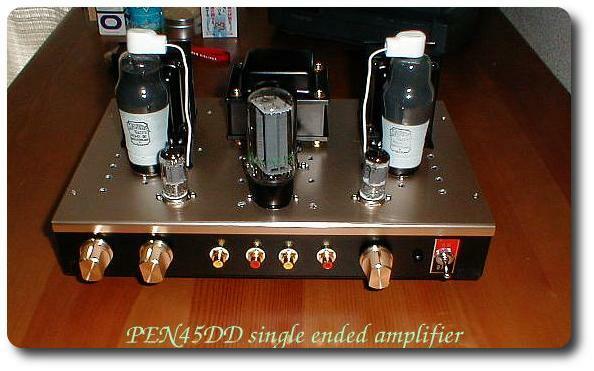 RCA 45 Although it was a single amplifier, it was an amp that was remodeled to PEN 45. All transformers use TANGO. Driver is 6SH7(Mesh) Hitachi and Power is Mazda PEN45. 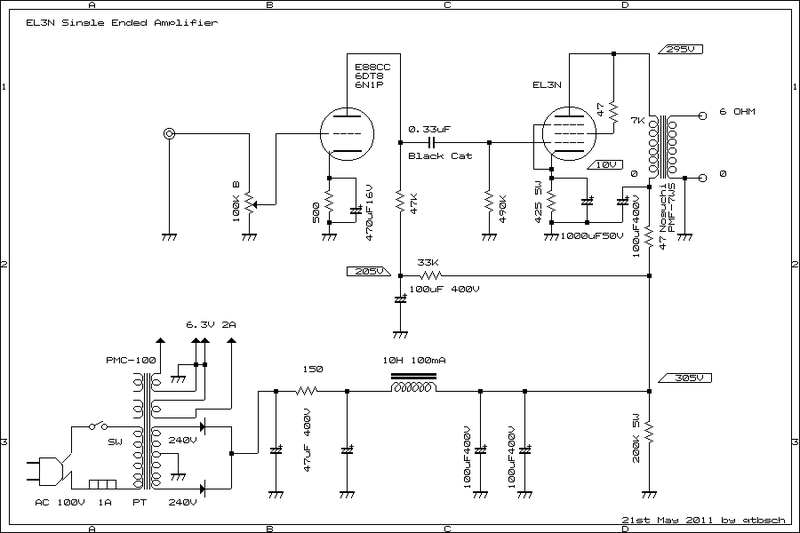 Only 3 W rms Base is Edison Octal base not same as US Octal Base. 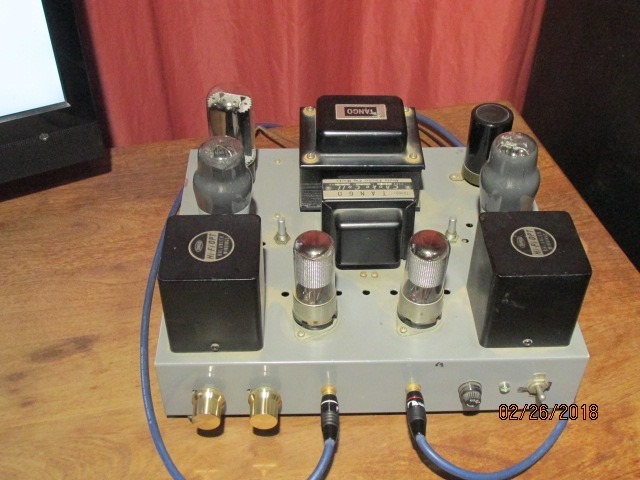 And another side of Amplifier of mine small push pull Amplifier and Triode Amplifiers. This time will be use PMF 5WS small Noguchi Transformer has UL tap.USD around $ 60 dollars.PMF-5WS has very good frequency response and high inductance. 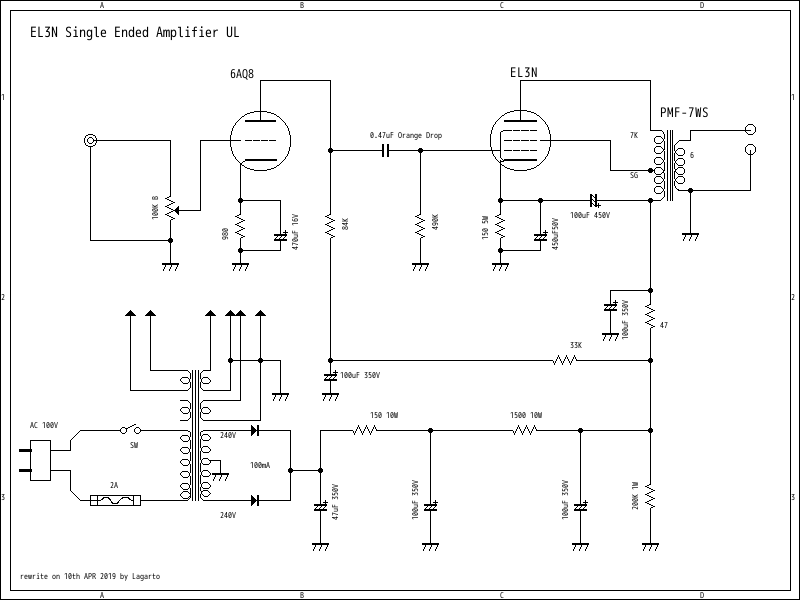 will be good single ended amplifier of around 3.5 W with UL . I have reassembled the EL3N single amp that had been dismantled. 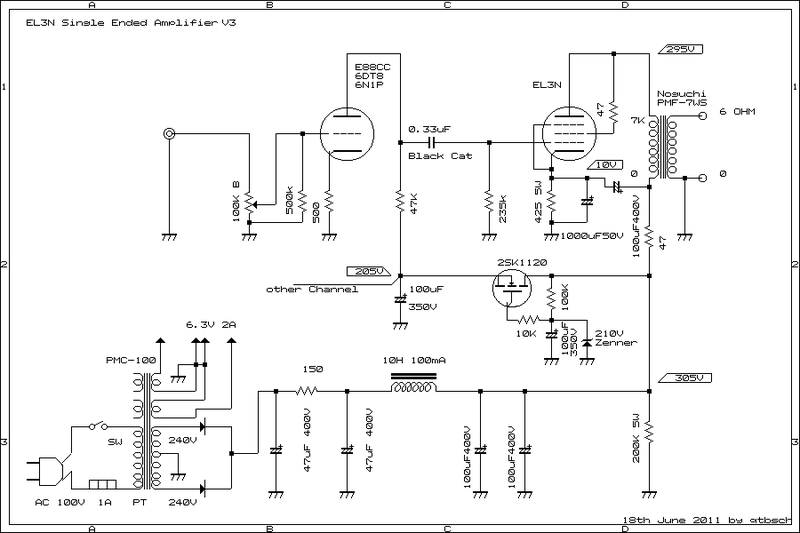 The circuit diagram is the same as the circuit drawn earlier. 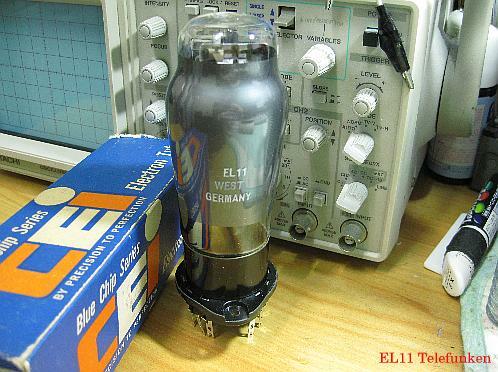 This EL3N has a very large heater current and is the same as 6L6 of modern vacuum tubes. Although there is no indication of the maximum plate loss, it seems to be about 10 W. This time I used as a UL connection. Originally this SG did not have an SG tap, but I used a 5K tap. For this reason, I use this method several times, but use the plate wire and the B + wire in reverse connection. I think it will be around 30%. 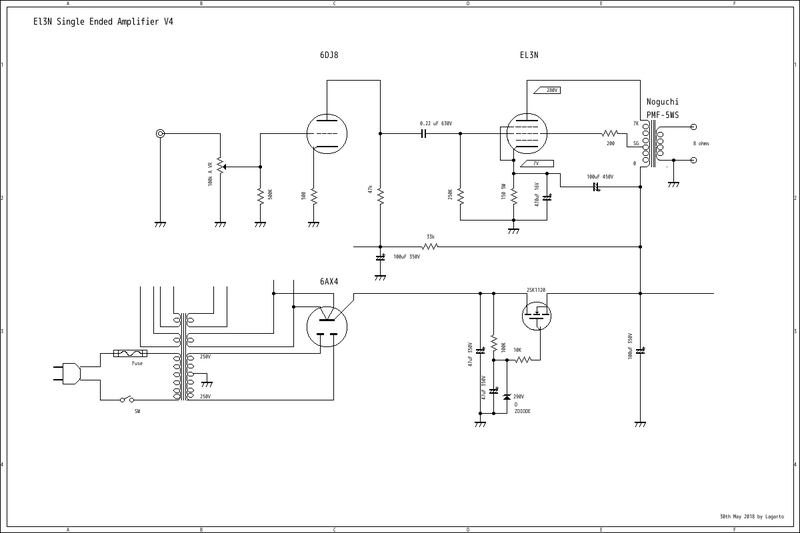 The schematic is shown below. The sound is very good and is the sound quality found in European tubes. It is the same tendency as EL156 that the bias is very shallow. It is a sound coming from a 1940 vacuum tube, but I think it is an incredible sound. 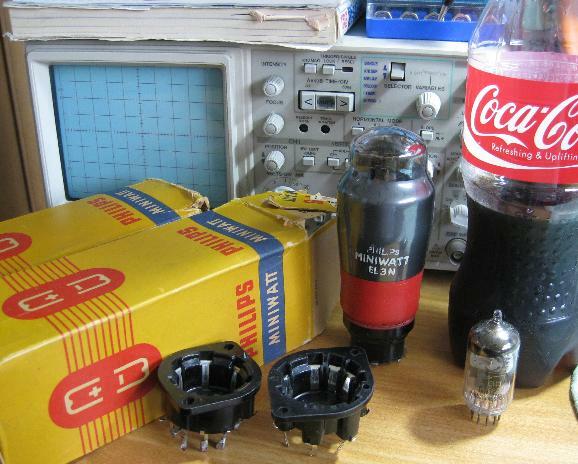 this old pentodo vacuum tube as NOS that is on the market. The low range is substantial because the heater current is large. The sound of the middle high range is also beautiful. Is it a place where 3.5 W says output? The sound of a direct heating triode is coming out. I think it is a very good vacuum tube. You just need a good 7K ohm output transformer. 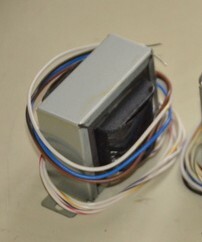 The model number of the output transformer is a transformer named PMF-7WS, a General Transformer Sales company. Sound evaluation: 6AQ8 / 6DT8 was made into the first rank. Making the cathode resistance of 6AQ8 a good value of 1K ohm or more produced good results. This time I made 980 ohms because of the resistance I have. 6AQ8 has a U (mew) of 60. It is a high frequency tube. I have always liked this tube for a long time. The load resistance was chosen to be 84K ohms. It became a sound that brought out the goodness of the clear sound, EL3N. Classic In particular, stringed instruments and pianos can be heard lively. It is a very bright sound, but the low range has come out well, and I think that how the strings sound is very good.
. I also listened to Jazz, and the middle and high range of the tightness of the low range became a great sound. I would like to recommend collecting parts and making one. It is a magical vacuum tube. this is pentodo but sound like direct heating Triode Single Ended Amplifier sound. 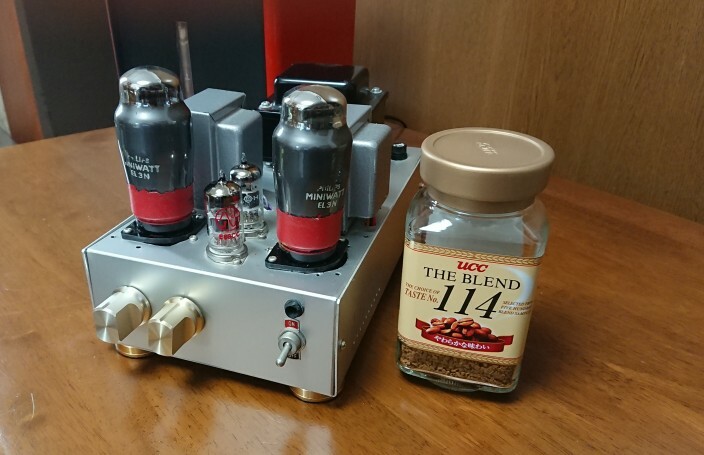 I do not know if the characteristics of this transformer are good or the characteristics of the vacuum tube are good, but I think it will make a very pleasant sound. Even from the viewpoint of the EP-IP characteristics, I think that the linearity is very good and similar to 45. Study ValveAmplifier D.I.Y but in Spanishgood for you.old Argentina book.